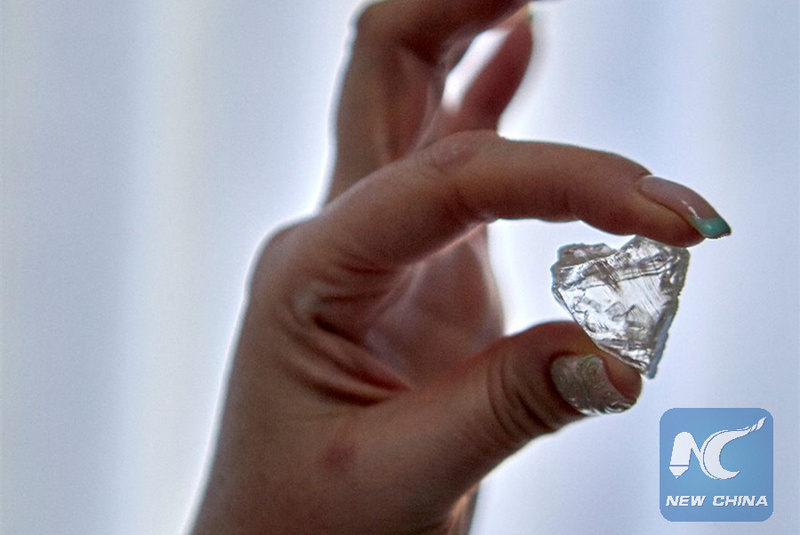 MOSCOW, Feb. 14 (Xinhua) -- A heart-shaped rough diamond has been found at the Udachnaya kimberlite pipe in Russia's far-eastern Republic of Sakha (Yakutia), Russian top diamond miner Alrosa said Thursday. "Diamonds of a distinctive shape that resemble some object or symbol are extremely rare in nature," Yevgeny Agureyev, director of Alrosa's United Selling Organization, said in a statement. "The appearance of a heart-shaped rough diamond, especially on the eve of Valentine's Day, seems to be a symbolic gift of nature not only to our company, but also to all loving couples," he said. The gem, endowed with high-quality characteristics, weighs 65.7 carats. According to expert estimates, it is more than 300 million years old, Alrosa said. The heart-shaped diamond is currently at the United Selling Organization for detailed examination and evaluation, the miner added. Last year, Alrosa found a rough diamond in the shape of a soccer ball and another in the shape of a skull.